A committee will begin work towards the canonisation immediately, CCI convenor Stefan Gigacz said in a statement. “Cardijn played a key role at the Second Vatican Council as a member of the Pontifical Commission on Lay Apostolate and later at the Council itself,” Mr Gigacz said. “His See Judge Act method was endorsed by the Vatican II Decree on the Lay Apostolate, Apostolicam Actuositatem, and was adopted in the drafting of the Pastoral Constitution of the Church in the Modern World, Gaudium et Spes. After the Council, Cardijn’s method formed the basis of the “new evangelisation” process launched by the Latin American bishops at Medellin in 1968. ¨”It is extremely heartening to hear that, in his address to the Synod of Bishops, Chilean Bishop Pedro Ossandon Buljevic again emphasised the See Judge Act method as integral the process of ‘new evangelisation’,” Mr Gigacz added. Conference speakers included former Caritas Asia director, Fr Bonnie Mendes, Indian professor Fr X. Selvaraj SJ, Attorney Aurora Santiago, President of the National Council of the Laity of the Philippines, and Fr Marlon Lacal of the Association of Major Religious Superiors of the Philippines. 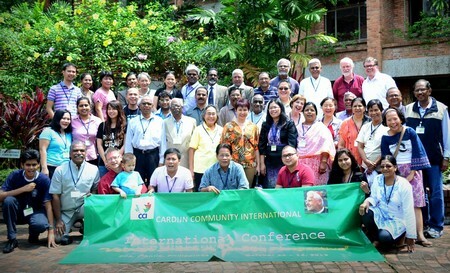 In other major decisions, the conference also adopted resolutions to prepare an international survey into the social impact of Vatican II among grassroots Catholics around the world, the results of which will be shared at a global conference to be held in India in 2015.